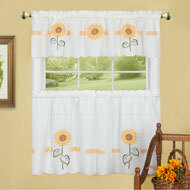 This cheerful door décor features brightly colored daisies in shades of yellow and white atop a green scrolling base. Charming ladybugs and a "Welcome" banner are the perfect finishing touches. Hardware on back for easy hanging. Iron. 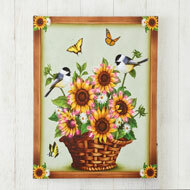 12"L x 17 1/2"H.
This charming canvas features a basket full of cheerful sunflowers and daisies. Chickadees perch atop the flowers and butterflies flutter over the arrangement that shines with 50 colorchanging, fiberoptic lights. Requires 2 "AA" batteries (sold separately). 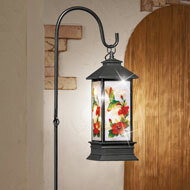 Includes on/off switch on the side and a hook on back for easy hanging. Polyester and wood. 13"L x 17"H.
This charming rug is perfect anywhere in your home. 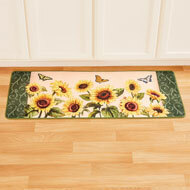 The soft, cushioned runner features bright and festive sunflowers accented with butterflies, and is trimmed in a green scroll border. Skidresistant backing. Hand wash. Polyester, PVC and polyurethane; imported. 19 1/2" x 48". 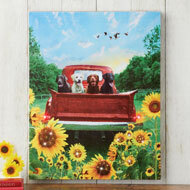 Thirty fiber optic lights shine from this beautiful field of sunflowers where four loyal labs wait in the back of a red pickup truck. The tail lights of the truck shine as well with red LED light. Req. 2 "AA" batteries (sold separately). Includes on/off switch on the side and a hook on the back for hanging. Wood and polyester.  13"L x 17"H.
This charming bath mat features a beautiful wreath with sunflowers, autumn leaves, berries and pumpkins atop a white background. Adorable chickadees and a burgundy plaid border are the perfect finishing touches. 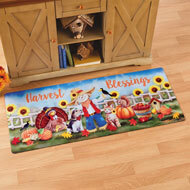 The cushioned bath mat provides soothing comfort while standing at the sink or drying off after a bath. Skidresistant backing. Spot clean. PVC, polyester and foam; imported. Approx. 31 3/4" x 19 3/4". 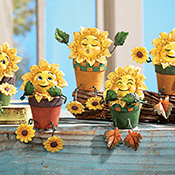 Make autumn's prettiest flower bloom throughout your home with this set of 5 sunflower sitters. Each is individually styled and packed with plenty of personality to harvest a bumper crop of smiles whenever you see them. Legs and arms are bendable wire so you can pose them as you please. Polyresin. Each approx. 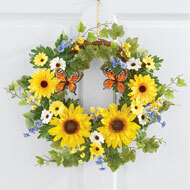 3"H.
Brighten your front door or any room in your home with this colorful sunflower wreath. A cheerful collection of sunflowers, daisies, greenery and two delightful birds decorate the wreath, while a hook on the back makes hanging easy. Polyester and vine. 16"Dia. 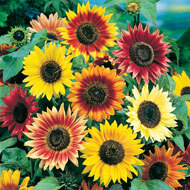 Brighten up your home with this sunflower runner. 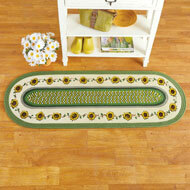 Sunflowers bloom against an ivory background that surrounds a yellow, white and green braided design in the center. A solid green outer border is the finishing touch. 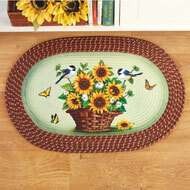 Helps protect your floors while adding a welcome splash of color. Spot clean. Polyester and polypropylene; imported. 20" x 60". 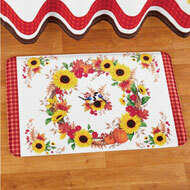 Perfect anywhere in your home, this colorful sunflower rug will warm your floors all year long. The delightful design features a basket of bright sunflowers accented with chickadees and butterflies atop a cream background. Sturdy braided border. Spot clean. Polyester and polypropylene; imported. Approx. 20" x 30". 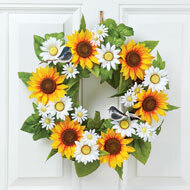 Brighten your front door or any room in your home with this colorful sunflower wreath. A cheerful collection of sunflowers, daisies, ivy and butterflies bring it to life, while a hook on the back makes hanging easy. Polyester, plastic, rattan and vine. 16"Dia. Three sparkling LED lights shine from the windows of this rustic barn and add a warm glow to the charming scene. 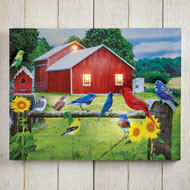 Bright sunflowers and colorful birds add to the nostalgic charm. On/off switch on the side. Hook on the back for easy hanging. Req. 2 "AA" batteries (sold on order form). Wood frame with polyester canvas. 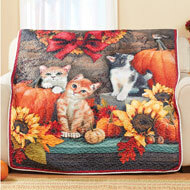 17"L x 13"H.
Add seasonal color to any room in your home with this lovely quilted throw. The beautiful quilted throw features a charming scene of kittens surrounded by bright sunflowers, autumn leaves and pumpkins, while a burgundy border provides the finishing touch, and the reverse side is solid white. Machine wash. Polyester; imported. 60" x 50". Colorful pumpkins, sunflowers, berries and leaves make this topiary a spectacular addition to a seasonal centerpiece or mantel display. 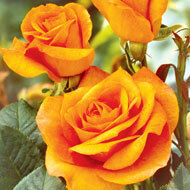 The vibrantly colored arrangement sits in a pedestal style vase with an antiqued finish. Resin, plastic and polyester. Approx. 10"Dia. 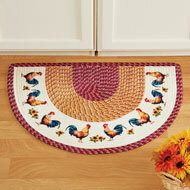 x 19"H.
Perfect anywhere in your home, this sliceshaped, braided rug features a classic French Country rooster design. Colorful roosters and bright sunflowers decorate an ivory border that surrounds the gold and burgundy center. The rug has a unique half circle shape to protect your floors and provides a soft area for your feet while working in the kitchen. Spot clean. Polyester and polypropylene; imported. 30" x 20". 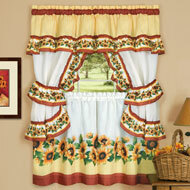 Welcome the season with handpainted, pumpkin wall art accented with cheerful sunflowers and wheat. 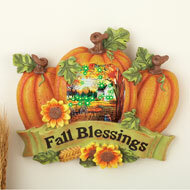 A banner reads "Fall Blessings" & the beautiful farm scene in the center shines with colorchanging fiber optic lights. Req. 3 "AAA" batteries (sold separately). On/off switch. Resin. 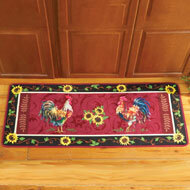 10 1/2"L x 2 1/2"W x 9"H.
Beautiful cushioned rug features delightfully detailed roosters atop a burgundy background. The bold black border includes colorful sunflowers and greenery. Cushioned foam rug provides soothing relief under your feet in the kitchen or anywhere in your home. Hand wash. Polyester, plastic and foam; imported. 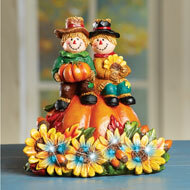 48"L x 19 1/2"W.
A charming addition to your harvest home, this handpainted tabletop decor features bright sunflowers surrounding a pumpkin topped with two smiling scarecrows. Colorchanging fiberoptic lights and colorful Fall leaves are the perfect finishing touches. Req. 3 "AA" batteries (sold separately). Resin. 8"L x 6"W x 8"H.
This bright and colorful rug features a fun barnyard scene with a turkey, cat, dog, crows and a scarecrow in the center. 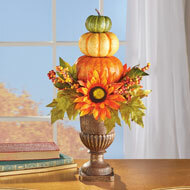 Fall accents including sunflowers, pumpkins, leaves and apples add a splash of harvest style. Skidresistant backing. Spot clean. Polyester and rubber; imported. Measures 47" x 19 2/3". 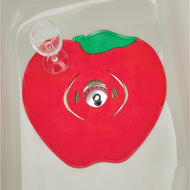 These fun and functional sink mats protect your dishes from chipping and your sink from being scratched. The soft and flexible mats have a skidresistant bottom and will stay in place while they catch debris and allow water to pass through. Set of two. PVC. Each is approx. 11"Dia. Available in Apple or Sunflower. Buy 2 or more, only $8.99 each! 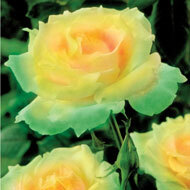 This exceptional mini rose has fragrant flower clusters from spring well into the fall. 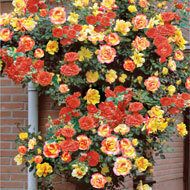 Ideal as a spreading ground cover, the beautiful roses also look great in borders, rock gardens and pots. 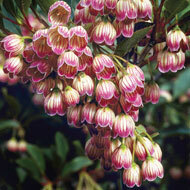 Thrives in well drained soil and full sun. 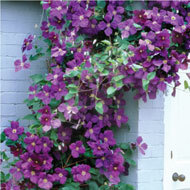 Grows to 6"12" tall and spreads over 3feet wide. Disease and pestresistant. 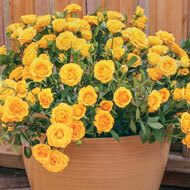 Plant format/size: One 2 ¼" pot with 4"6" top. Planting Zones 310. Buy 2 or more, only $13.99 each! Each petal of these beautiful Hydrangeas looks like it's been handpainted, and its massive flower heads (up to 10"Dia.) cover nearly every inch of the foliage. 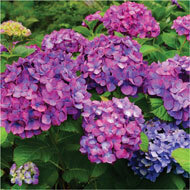 These hardy Hydrangeas prefer full sun in the north and some light shade in the south. They grow 3'4' tall and just as wide. 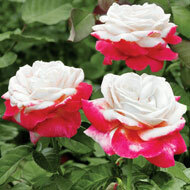 Resistant to pests including deer. 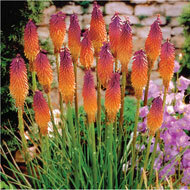 Plant size/format: One 2 1/4" pot with 4"6" tops.